Last few days had been so terrible for people in Uttarakhand India due to the heavy floods and resulting in many people missing or getting killed. The connectivity has taken a big hit both in terms of physical roads and cellular network. Even the weather is too bad now for rescue operations to be carried on smoothly. Google has launched the its popular ” Google Person Finder” service for getting information about missing persons for the Floods in Uttarkhand, India. It is an web application developed and hosted by Google which uses the data gathered from individuals to post and search for the status of relatives or friends affected by a the floods or any other disaster. 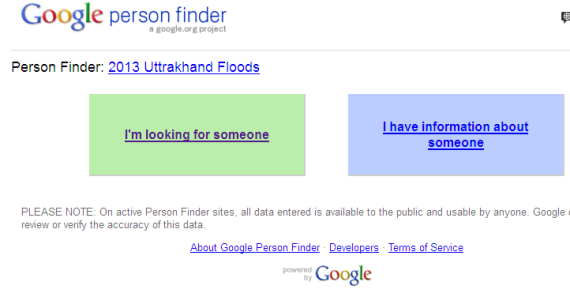 You can access the Google Person Finder for Floods in Uttarkhand here. All the data gathered by this tool is publicly available and can be searched or accessed by anyone on the web. Even the press agencies, non-governmental agencies and any other agency can contribute to the database and receive updates.